Transform Plate Boundaries are locations where two plates slide past one another. 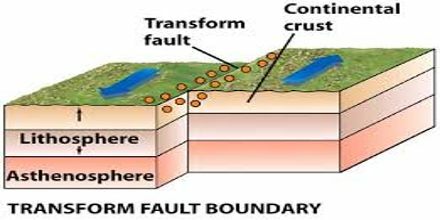 The fracture zone that forms a transform plate boundary is known as a transform fault. Main objective of this lecture is to present on Transform Plates. Transform boundaries are places where plates slide sideways past each other. At transform boundaries lithosphere is neither created nor destroyed. Example: California’s San Andreas fault is a transform boundary.